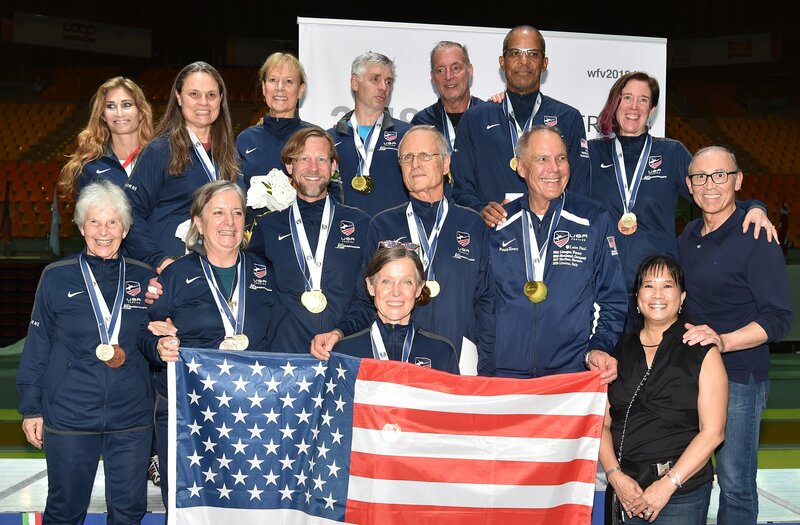 (Colorado Springs, Colo.) – Team USA ended the Veteran World Championships with another two medals on Sunday in Livorno, Italy as the men’s épée team won gold for the second consecutive year and the women’s saber team secured bronze, continuing the squad’s medal streak as the team has stood on the podium every year since 2014 when the team events were introduced. The two medals brings Team USA’s medal count to 12, which is fourth in the tournament behind Italy, France and Germany. The men’s épée team was led by Walter Dragonetti (Las Vegas, Nev.), who won the silver in the individual competition. He was also joined by Daryl Taylor (Los Angeles, Calif.) as the second 60-69 fencer, 1992 Olympians Jon Normile (Millburn, N.J.) and Chris O'Loughlin (Jersey City, N.J.) from the 50-59 category, and Frank Hewitt (Jamul, Calif.) and Bruno Goossens (Jacksonville, Ore.) from the +70 event. The U.S. went 2-0 in pools with wins over the Netherlands and Finland before advancing to the quarter-finals with a 30-16 win against Belgium. To reach the final, Team USA overcame France, 30-24, and Italy, 25-17. Fencing for gold against Sweden, Normile took the opening bout, 5-3. Dragonetti then won the third bout, 6-4, to expand the lead to four at 11-7. With the same score entering the final bout, Dragonetti came through again, winning the sixth round, 15-10, to take the match, 26-17. Dragonetti led the U.S. with a +7 indicator on the match. The women’s saber team entered the team event with three medalists from the individual competition in 60-69 gold medalist Jane Eyre (Woolwich Twp, N.J.), 60-69 silver medalist Delia Turner (Philadelphia, Pa.) and +70 bronze medalist Anna Mannino (Oceanside, Calif.) Ellen O'Leary (Seattle, Wash.) joined Mannino in the +70 slot with Chaz Smith (Placerville, Calif.) and Robin Pernice (Carlisle, Mass.) competing as the squad’s 50-59 fencers. With pool wins against Germany and France, the U.S. earned the No. 2 seed in the direct elimination bracket. In the quarter-finals, Team USA cruised past Australia, 30-15, but in the following round, missed a chance at gold with 30-25 loss to Italy. The team rebounded in the bronze medal match, posting a 30-24 win over Germany, to solidify a medal for the fifth consecutive year. Click here to view complete results.